I had a delicious chicken dish at a friend's home and decided then and there to make it. When I was making salmon, last night, I thought about doing something similar with the fish. 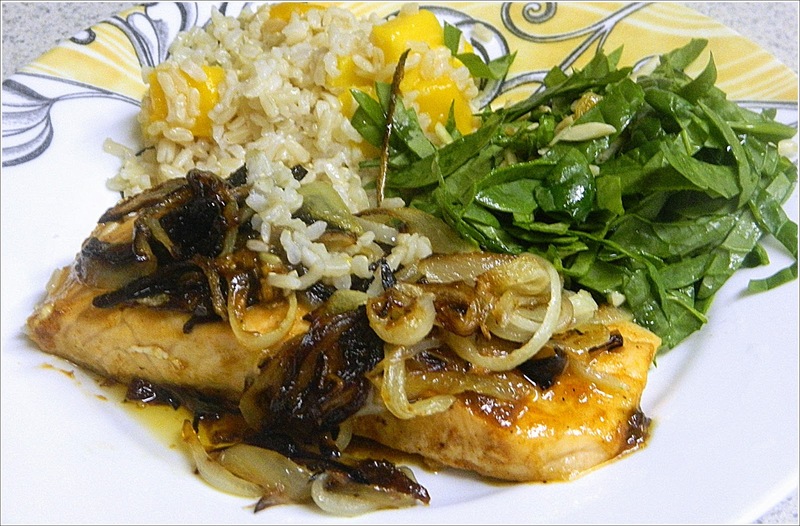 In looking for a recipe with salmon and caramelized onions, I found this recipe, which is probably the best salmon, I have made. The spices worked well together and the sweetness of the onions was icing on the cake. Heat the remaining 2 tablespoons of olive oil in a small pan over medium heat. Stir in the onion, and cook until tender and golden brown, about 10 minutes. Push onions to side and put salmon in pan. Cook the salmon fillets in the hot skillet until golden brown on each side, and no longer translucent in the center, about 6 minutes per side. Pour the browned onions and olive oil over the salmon fillets to serve. The seasoning for the fish looks very flavorful and the caramelized onions make everything taste great. Looks delicious! I've always pan-fried my salmon and seasoned with salt and black pepper (really boring I know), but this is definitely a great alternative to my usual routine, looks delicious! Looks like a quick and easy meal. Yum. We will just love this Salmon and can't wait to try your recipe! Thanks so much for sharing with Full Plate Thursday and have a great weekend. Your flavor combination sounds wonderful! I'd love to try your salmon recipe! Thanks for sharing it with us at #FoodieFriDIY! My mother makes salmon every Friday almost like this. She adds sliced mushrooms the the onions in hers. I'm psyched to see a pan-fried version, as opposed to oven-baking. So moist. I've been looking for more interesting salmon recipes since we always grill ours and serve with pesto. I'm looking forward to trying this version. Thank you for linking it up at This Is How We Roll Thursday. Please come back this week and share more of your great recipes!